Twitter is a great place to grow your business, but things move very quickly on the platform. The average lifespan of one tweet is only about 18 minutes. Over 7,000 new tweets are sent every single second. The shelf life of one tweet is four times shorter than anything you post on Facebook. This makes it hard to get your messages to stick and make an impact. It’s easy to get lost in the crowd. That’s why your tweets and Twitter marketing techniques have to pack a punch to get people to take action and pay attention to you. But it can be hard to know exactly what techniques work and which ones are a waste of time. Thankfully, you won’t have to spend any time figuring that out. Here are 12 powerful Twitter marketing tips (that actually work). Your Twitter handle has to be recognizable, easy-to-remember, and short enough for people to easily tag you. When someone tries to search your name, they will use your handle to find your page. Keep your names consistent across all social media profiles. If you use a name that’s different from your brand or company name, you might confuse followers or make your page hard to find. The business name “H&M” is already catchy, short, and easy-to-remember, but the handle is even simpler. They use this handle consistently across all of their social media accounts. No unnecessary characters are added, making their pages easy to find. If you’re just getting started, choose a Twitter handle that is as close to your brand’s name as you can get. Steer away from irrelevant numbers or any kind of punctuation marks. Keep it short and sweet, too. With a short Twitter name, you’ll be more likely to get @mentions from other users and brands. People are less likely to mention businesses with long Twitter handles due to the character limit of each tweet. Potential customers might interact more with your Twitter account than they would with a physical store. For this reason, you need to make sure that your profile picture is recognizable and memorable. It’s not uncommon to go with a logo, which will nurture brand awareness. Anytime someone interacts with your Twitter account, they’ll become even more familiar with your logo and recognize it when they see it elsewhere. Some of the largest brands out there understand how important consistent branding really is, and they almost always use their logos as profile images. The cleaner and simpler the logo, the better. Stick with a version of the image that can be seen even when compressed, since people will be viewing your profile on different-sized devices. If you have a personal brand and account, use professional headshots as your profile images instead. And keep in mind that your header space at the top of your profile page can also be used to promote brand awareness. This is the place to unleash your creativity and show off your brand message and personality, like Target. The picture is catchy, fun, and even incorporates the logo. Snuggle, a fabric softener brand, uses colorful, loveable images on their Twitter account to draw people in. They make use of their lovable “mascot,” the Snuggle Bear, to keep people entertained. Don’t treat all of the branding opportunities on Twitter as an afterthought, or you’ll miss out on huge marketing opportunities to gain new customers. Your bio is another place on your profile that needs to fit in with your brand’s image. Your Twitter bio is a 160-character location to showcase your company right under your profile photo. You need to create a killer one. It explains who I am, what I do, the company I founded, and who I founded it with. Keep it accurate. Tell people exactly who your brand is. Incorporate some personality or humor. Don’t be afraid to tell a few jokes or say something original. Brag a bit. If your brand has some great accomplishments under their belt, tell people. Have thousands of existing customers? Let people know. Keep it targeted. Write a bio that will attract people that fit in with your target audience. Add relevant hashtags so that people can find your account when they search for those terms. Be sure to tag other brands that you may be associated with in this space. It also helps to tweet during peak hours when most people are online. There are certain days of the week or times of day when users are more active on Twitter, meaning they’ll actually be more likely to engage with your posts. By identifying those hours and days and posting during them, you’ll gain more impressions, boost engagement, and get tons of clicks. According to Buffer, tweets posted on Friday, Saturday, and Sunday have higher CTRs than those posted during other days of the week. Some studies have shown that posting between 12 PM and 6 PM is the best time to post. Others suggest that the hours between 12 PM and 3 PM on Monday through Friday work best. Your peak posting times will depend on your specific audience, so test how your content performs at different times and days to find out what works best for your brand. Once you’ve figured them out, use scheduling tools like Hootsuite or Buffer to schedule your posts to go live at peak hours ahead of time. And when you post, be sure to use the right hashtags. Keep hashtag use to a minimum if you can, too. Don’t overload users with tons of hashtags for everything you post. 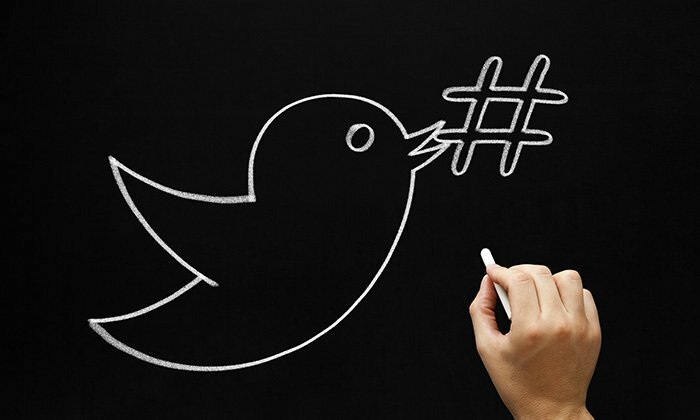 Tweets that contain hashtags receive 2x more engagement than those that don’t. But tweets with more than two hashtags receive a drop in engagement by 17%. It’s important to use the right kind of hashtags without overusing them. Only include hashtags that add some context to your tweets. Find your most popular hashtags by using Twitter analytics. You can also use a tool like Hashtagify to find the best hashtags for your tweets. The tool suggests hashtags that are related to the keywords you enter. With Hashtagify, you can also determine the strength of your hashtags before you use them, so you’ll know which ones work best before tweeting them out. RiteTag is another alternative that works similarly to Hashtagify. Next, focus on running some advanced searches. Wouldn’t it be nice to find people who are interested in your services or products at this very second? Or figure out exactly what people are saying about your brand? Luckily, there is when you use Twitter advanced search. Instead of sending out promotional tweets or writing to your existing customers, find potential ones by searching through industry-specific terms. For example, if you’re a bakery, search for terms like “baker,” “bakery,” or “cake” in your area. You’re more than likely to find at least one tweet from a person looking for a baker in your region or dealing with a customer service issue with another bakery. Advanced searches put new leads right in front of you. Reach out to those people and tell them how you can fix their problem or help them out. When you add images to your tweets, you’ll get more shares and clicks than the tweets without images. In fact, tweets with images typically receive 89% more “likes” or favorites. Make sure only to add compelling images that are relevant and high-quality. Never use an image that doesn’t relate to your tweet just for the sake of adding an image. If you’re tweeting about a recent blog post, add an image from the article with a link where users can find more information. Or, if you want to tweet about a new product or service, include an image that showcases it. You may even be running a promotional deal where followers can get discounts. Use a tool like Canva to create a simple graphic like this one and add it to your tweet. Photos aren’t the only thing to focus your attention on, though. Use video as often as you can. Images get more attention than plain old text, but videos outperform images. Twitter video allows Twitter users to record a new video from a device or upload an existing video. Simply add a branded video to your tweets to get more attention, like this one from Michael Kors. According to AdWeek, videos are six times more likely to be retweeted than photos and three times more likely to be retweeted than GIFs. Videos are a great way to share new information with followers, share behind-the-scenes content, elicit emotion, and give your tweets a longer lifespan. You can also go live with the live video feature. Live videos are automatically posted as tweets, which are still watchable once the live video ends. Next, focus on conducting polls that people can interact with. One of the easiest ways to create more activity on your Twitter page is to create a Twitter poll. All you need to do is click the same button you always click to add a new tweet, then click on the poll icon at the bottom of the screen. Next, add your question and choices. Polls aren’t just fun for followers to complete. They can also be used to conduct consumer and market research, get feedback, and initiate engaging conversations with followers. Anyone can create a poll, but creating unique and engaging questions takes a bit of thought. Look to other brands that are using polls consistently and successfully, like Airbnb, for inspiration. And don’t forget to use creative calls-to-action (CTAs) that you can easily tweet out to drive sales or boost downloads of your latest app or e-book. The entire idea behind Twitter marketing is to drive sales, generate leads, boost clicks, and increase downloads. Creating posts to drive these actions, when used sparingly, can boost your engagement in huge ways. Adding a CTA to a few tweets is the quickest way to do this. You’re probably already using CTAs asking users to share your posts, which is great. But this isn’t the only CTA that you should be using on your Twitter profile. If you have an app, let people know about every update you release. Cookie Run does this often. Use the word “free” as often as you can, too. Everyone loves freebies. Using effective action words and switching up CTAs will drive engagement and boost your CTR, send more traffic over to your site, generate new leads, drive downloads, and boost sales. Twitter is the best network to test headlines. Testing headlines on Twitter is a great idea because the visual elements aren’t as prominent on as they are with a platform like Facebook. Buffer introduced this idea with a guide on how to write great headlines on blogs and social media. After you publish an article, use a tool like Tweriod to find out when your followers are online. Then, tweet three to five headlines with trackable links during those peak times. Make sure that the headlines are different. Track the performance of each link. Next, put the same headlines into an A/B-testing service like Optimizely. Now, track user responses to the headlines there. You can compare those responses to the responses you got from the same headlines on Twitter. By using two sources, you’ll have a clearer answer about which headlines perform best. Then do some influencer outreach to put yourself in front of audiences that aren’t following you yet. It’s now easier than ever to pitch your ideas to someone with a large following. If they like what you bring to the table, they can change your brand’s world with one simple post. The first step to influencer outreach is identifying which influencers are out there for your specific industry. First, look at influencers that you’ve already been interacting with. Maybe they’ve liked a few of your tweets, or maybe you’ve responded to some of theirs. Do their posts align with your brand message? How many followers do they have? If they seem like a good fit, send them a DM asking to promote your company in a tweet. Another option is to use a tool like Klout to find new influencers you don’t know about yet. The tool can give you a good idea of just how influential certain people are online. Everybody that is active on social media receives a score between 1 and 100. The more influential a user is, the higher that number will be. Top influencers like Barack Obama or Justin Bieber have scores of 99 and 92, making them some of the most influential social media users out there. Influencers in your specific niche probably won’t have scores that high, but you can use the tool to find out how a couple of them compare. People with a Klout score of 63 or higher are in the top 5% of all users. Download the Klout Chrome extension to see everyone’s Klout score right beside their name on Twitter. When you need to boost engagement as fast as possible, Twitter Ads are the way to go. Especially if you don’t have a ton of followers just yet. Twitter Ads can be a bit more expensive than Facebook Ads, but they will boost engagement when you need it most. Promoted tweets are the best option for this purpose. Conversational ads are a close second. These ads are designed purely to boost engagement and increase brand influence. They are very similar to promoted tweets, but you can add CTAs that encourage users to tweet hashtags that can amplify your brand. Once a user clicks on their choice, a tweet composer opens with a brand message that users can customize and share. Once someone tweets this their selection out, they’ll automatically receive a thank you message. Conversational ads are powerful because you won’t just gain engagement on your post, your paid post will inspire tons of organic posts that are directly tied to your brand. This feature is currently in beta testing, though, so it isn’t available by default. Twitter is directing users to send a direct message to @TwitterAdsHelp to request access. Twitter is one of the best places to increase brand awareness and generate new leads, but things move quicker on the platform than any other social media network. The average lifespan of one tweet is just a few minutes, and thousands of new tweets are generated every second. Your Twitter marketing efforts have to be unique so that you stand out from the crowd. Start with the basics of your Twitter profile. Make sure that your brand’s handle is short and easy to remember. It should be as close to your company’s name as possible. Choose a profile photo that is a brand logo, or a professional headshot if you’re a personal brand. Your header should also convey your brand message. Optimize your bio to reflect exactly who you are as a company. Only tweet during peak hours. Once you’ve identified the best days and times to post, schedule tweets to go up during those times. Never use more than one or two hashtags per tweet. Make sure that they relate to your brand and the context of the tweet. Run advanced searches to find new leads that you can reach out to instead of waiting for them to find you. Add images to your tweets to boost retweets. Use Twitter video if you want even more engagement. Conduct polls to create new conversations centered around your brand. You can also use them for market research. Utilize creative CTAs that are different from the overused “share this post.” Ask people to shop now, download now, or learn more instead. Use Twitter to double A/B test headlines along with a tool like Optimizely. That way you’ll have more data about which headlines work best. Reach out to influencers in your industry and ask them to talk about your brand for even more exposure. Their followers will trust their recommendations. Finally, harness the power of Twitter Ads if you need to increase reach and engagement in a pinch. Conversational ads are a powerful tool as well, but you have to ask Twitter for access to them before you can get started using them. How do you use Twitter to promote and grow your business? The post 12 Powerful Twitter Marketing Tips (That Actually Work) appeared first on Neil Patel.